Far from home for the first time in his life, Dominican-born Domingo Leyba is getting his first taste of baseball life in the United States, and though home sickness constantly tugs at him, the opportunity to play every day is fueling the ascent of the Tigers' No. 7 prospect. "I miss everything," said Leyba. "The food, my family, everything. But it's my job and I need to do better every day. It's going really good and I feel great playing here." 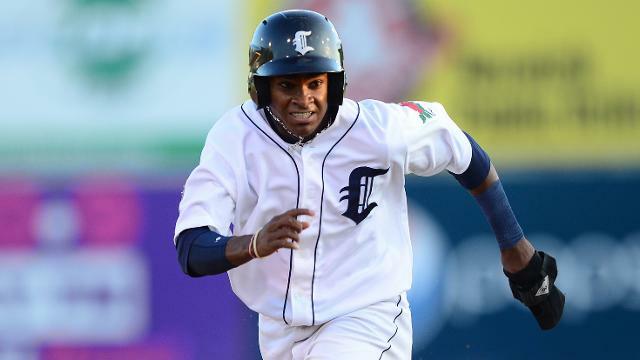 After playing his first pro season last year near his home in Santo Domingo for the Tigers' Dominican Summer League team, Leyba skipped the Rookie-level Gulf Coast League and landed in Connecticut in early June. Since arriving, the 5-foot-11 middle infielder has continued to show improvement across the board, flashing a line-drive swing from both sides of the plate and soft hands at second base, proving he was worthy of the jump to Class A ball. "It's a big step because I played summer league and now I'm in Connecticut," said Leyba. "I didn't have to play in the Gulf [Coast] League, so that was big for me." Leyba's abilities in the field may have spurred his leap to Norwich as he showed great instincts while splitting time between shortstop and second base in the DSL. Thus far with Connecticut, he has played only at second, where he's yet to commit an error in 21 games and 89 chances. Regardless of the results, Leyba misses his natural shortstop position and hopes to one day return to that post. "I feel comfortable at second, but I love shortstop," Leyba said. "I hope [to get back there soon]. I get to play every day at second, so that's good." The comfort level is also rising when he steps into the batter's box. He hit just .121 over his first eight games but has since found his groove, batting .357 over his last 14 contests. Now Leyba sports a respectable .270 average, while his 14 RBIs and 10 doubles are both second best for Connecticut. "I can do a little bit of everything," said Leyba. "I play defense, I hit line drives. The pitching is better here, I'm seeing more breaking balls, but everything is the same and the swing is normal." With everything in place, Leyba is looking toward bigger and better things now that he's made it to the United States, hopeful that Connecticut is not his last destination this season. "This year I want to play in [Class A full season] West Michigan," said Leyba, who has a backup goal in mind should he not make it. "I want to work hard every day to get to Michigan, but if I'm in this league, I want to play in the All-Star Game"
Still burning hot: It took just 19 games for State College's Rowan Wick to overcome what David Washington did in 72 games a year ago. With his 11th long ball of the season versus Batavia last Wednesday, Wick became the Spikes' single-season home run king, besting Washington's 10 in 2013. On top of home runs, Wick, who connected for No. 12 on Tuesday, leads the league in batting/on-base/slugging (.393/.505/.869), RBIs (30) and runs scored (23). All-out mowdown: Brooklyn starter Marcos Molina has been aces for the Cyclones, allowing just one earned run over 24 innings in four starts. His 0.38 ERA and 0.54 WHIP are both league bests, and his 26 strikeouts are tied for second most. Molina has also gone second longest without allowing a home run this season. A Tiger tees it up: Connecticut's Ben Verlander had a career night in the Tigers' 18-4 win over Tri-City on Tuesday. The outfielder went 4-for-5 with two singles, a solo homer, a grand slam, seven RBIs and four runs scored. Coming into the night, Verlander had just nine hits, no homers, three RBIs and three runs in nine games. The differential difference: Although they aren't allowing the most runs per game, the Auburn Doubledays possess the league's worst run differential, having allowed 1.12 more runs per game than they are scoring. On the opposite end of the spectrum, the State College Spikes are scoring 2.04 more runs per game than they've allowed. Auburn is currently eight games behind State College in the Pinckney Division. Craig Forde is a contributor to MiLB.com. This story was not subject to the approval of the National Association of Professional Baseball Leagues or its clubs.